The SFS uses Monte Carlo Evaluation to simulate different possible scenarios for future conditions. Mathematically, Monte Carlo simulation is a numerical integration of the probability density functions of all cashflows from deal, given the uncertainties in macroeconomic and idiosyncratic risk factors. Monte Carlo evaluation consists of repeatedly simulating the random processes that govern cashflow projections. The approach selects all relevant risk factors and parameterizes their dynamics. It is an excellent approach for use in managing complex credit portfolios because it can handle the numerous correlations among risk factors or any form of probability distribution. It is also a powerful approach for generating risk metrics on a single loan transaction and or portfolio of loans. The scenarios include macroeconomic variables such as GDP, bankruptcy rates, inflation and interest rates and include deal-drivers such as rental rates, capital values, vacancy rates and commodity values. Within each deal idiosyncratic risks such as tenant defaults and construction cost over-runs are covered. 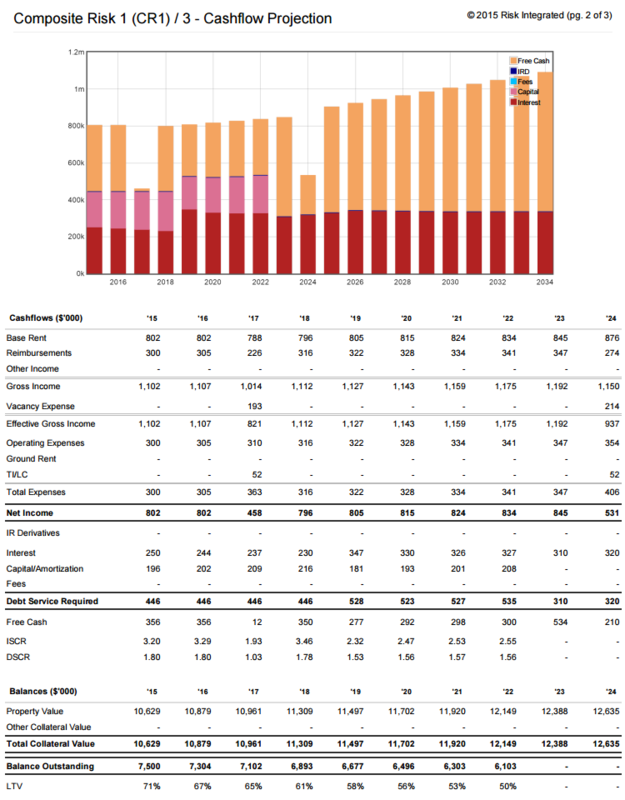 For each scenario, the system calculates the financial resources available to service the debt each year and if the resources are insufficient, a default is flagged. If a default does occur, the SFS calculates the subsequent loss given default. The process of creating a scenario and calculating the resulting loss is repeated several thousand times. 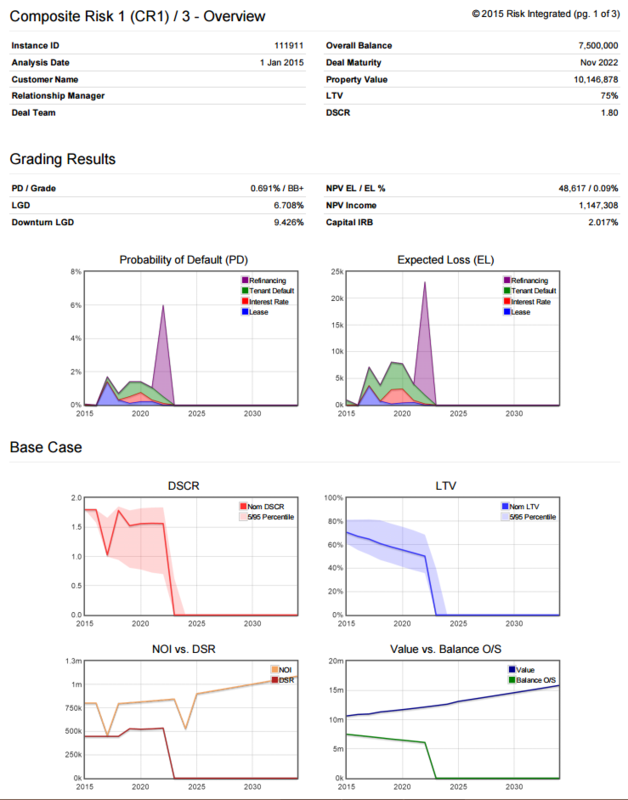 From the outcomes of thousands of possible scenarios, Risk Integrated calculates risk statistics such as the probability of default, loss given default, downturn loss given default, expected loss, unexpected loss and maximum probable loss for both individual loans and the whole portfolio—resulting in a complete statistical risk profile based of the simulation results. The simulation method used in the SFS is a straightforward approach that is easily understood, but includes variance reduction and parallel processing to minimize run times. The results can be used to show lending officers how to best structure individual deals. The example summary result below shows the degree of risk, the main risk sources and the years of greatest risk. This can be used in restructuring the financing package to better match the variability of the income stream.